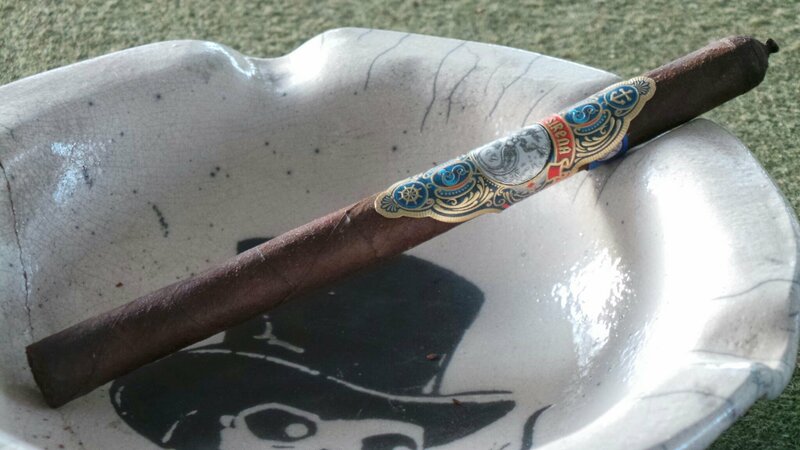 I recently had a chance to try the La Sirena Triton after a trip back to visit family in Tennessee. The cigar is a shop exclusive for SILO Cigars in Knoxville (specifically Farragut), TN produced by My Father Cigars for La Sirena/Miami Cigar in 2013. I had the maduro version, which carries a CT Broadleaf wrapper, Nicaraguan Criollo ’98/Nicaraguan Corojo ’06 binder, and filler blend of Nicaraguan Habano and Corojo. It is a 7 1/2″ X 38 lancero produced in a single run of 50 boxes of 20 (1,000 cigars) with an SRP of $10 per cigar. Chris Whaley of SILO was kind enough to provide one of the two samples smoked for this review. The Triton (maduro) is evenly and quite darkly colored, with a rustic Connecticut wrapper. The wrapper has an oily sheen when held in the light, but a rough feel due to the tooth on the leaf itself. Additionally, it has significant veining, as would be expected from this leaf. I detected neither soft nor dense areas within the pack, and from all appearances both examples were well made. The prelight draw offered free but acceptable resistance, and a mild, sweet barnyard/loft hay flavor. The aroma before light was similar. The initial puffs bring forth medium spice, and a very toasty and bready set of flavors. There is an occasional, fleeting glimpse of cedar flitting about during these first few minutes as well. Within ten minutes or so, the cedar has taken a more prominent position in the profile – with a solid peppery presence on the retrohale. Nearing the end of the first inch, these flavors have solidified and begun to settle. As I approach and enter the midsection of the cigar, as I have the chance to give the Triton a more diligent examination, I’ve noticed the burn has been slightly wandering on this second example. It never truly got out of line, but was enough to keep my attention throughout the entire first half of the cigar. The ash has also been more apt to fall before reaching any great length. This differed from the first Triton I smoked, which was quite well behaved throughout. The flavors continue within the earlier noted bready, yeasty palette. There are some occasional sweet notes that make an appearance, but overall the range is narrow – which is not intended to sound negative. These flavors are very pleasant, and I have enjoyed each of the Triton examples I’ve had. Too many people make an assertion that complexity is based entirely on how many times he or she perceives a bold “change in flavor.” Personally, I measure complexity by the minor nuances that only make themselves known to those willing to give the cigar the attention it deserves. There are myriad nuanced flavors to be found in the Triton, but they are not obvious. It is worthwhile to set aside time to actually pay close attention to the cigar. If you’re busy working, driving, or chatting with the crew at your local shop you might not perceive everything it has to offer. Within the Triton – particularly as it nears the mid- and final sections – I found remarkable diversity in the form of citrus, cedar, and a broad nuttiness. The citrus in particular was deceptive. Most often, it appeared in occasional spurts of sweetness. However, in the final segment of the cigar it came through with a marked lemon tendency. Overall, I thoroughly enjoyed the Triton. The flavors were consistent and pleasant, the construction spot-on, and strength moderate (medim-full if you’re keeping score). 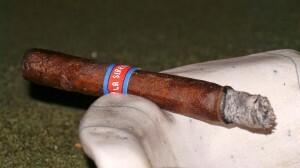 If you are a lancero fan it would be beneficial to call the guys at SILO and pick up a few before they’re all gone. If you are willing to invest the time and attention to it, you will be greatly rewarded. Being a fan of smaller ring cigars, I would not hesitate to have these onhand regularly – that is, if they were regular production, and available nearer than the 700 mile trip to Tennessee. Highly recommended. Price isn’t out of line, but on the upper end of this particular stick’s value.